Mrs. Minor's morning kindergarten class made a graph of their favorite candy. They tasted each candy first and then voted for the one they liked best. 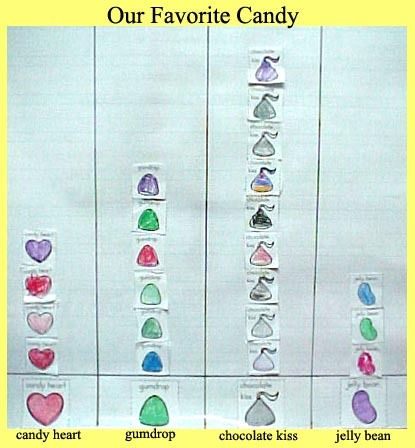 Each student pasted a picture of his or her favorite candy into the bar graph. Here is their graph and along with some questions for you! Which candy got the most votes? Which candy was liked by the least amount of people? How many chocolate kisses and candy hearts are there altogether? How many more gumdrops are there than jelly beans? Graph was made for the "Graph Goodies" project by Susan Silverman.